The Rev. Dodd wrote some fifty books, poems, pamphlets, theological works and newspaper articlesperhaps the best known being Beauties of Shakespeareand later in life was appointed tutor for Philip Stanhope, son of Lord Chesterfield. As the first Grand Chaplain of England, on May 1, 1775 he gave the oration on the occasion of the cornerstone laying for Grand Lodge on Great Queen Street. 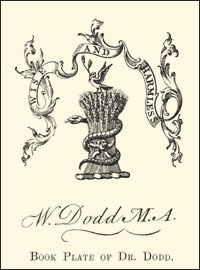 Dodd entertained lavishly and, deep in debt, forged his patrons signature to a note for £4,300. Chesterfield refused to prosecute but the Lord Mayor sent the case to court where the jury took all of ten minutes to find Dodd guilty and sentenced him to hang. Every visage expressed sadness; it appeared, indeed, a day of universal calamity.... Thousands sobbed aloud, and many a woman swooned at the sight.... [Dodds] corpse-like appearance produced an awful picture of human woe. Tens of thousands of hats, which formed a black mass, as the coach advanced, were taken off simultaneously.... [The crowds] silence added to the awfulness of the scene. Once the hangman, Ned Dennis, had "turned him off", Dodds friends rushed his corpse to the house of a surgeon where an unsuccessful attempt was made to revive him. The story, first published in The Northampton Mercury for Saturday, October 18, 1794, that he was revived and escaped to France, has not been confirmed. Source: Lord High Executioner, Howard Engel. p. 39. AQC vol. 19 (1906) pp. 182-85; vol. 20 (1907) pp. 352-55; History of Freemasonry, vol. iii, Robert Freke Gould p. 227. Bookplate : AQC v. xxi. p. 64.